An aging housing stock is usually thought of as a problem. Older homes can be more expensive to maintain and easily fall into enough disrepair to be a health or safety hazard or completely uninhabitable. Construction since the housing crisis has not kept pace with the homes that age out or are otherwise removed from the housing stock and this means that the overall age of the U.S. housing stock is gradually aging. 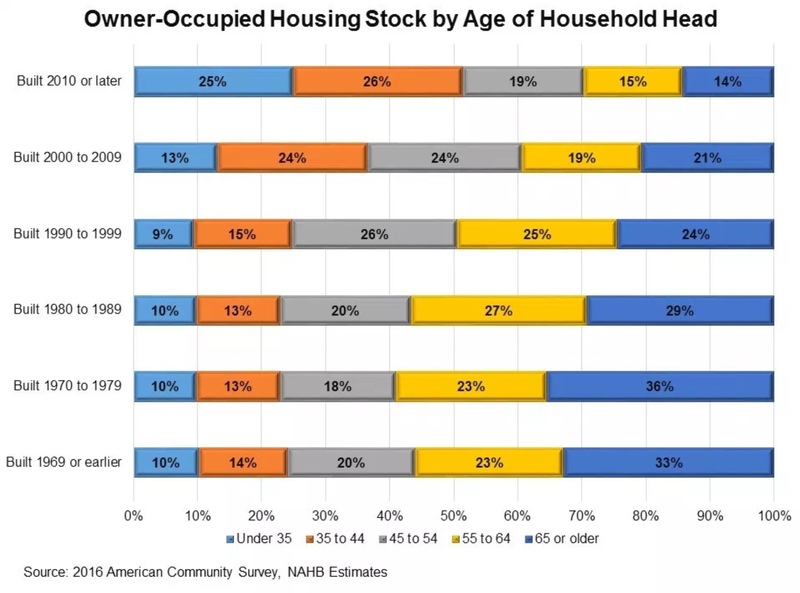 Na Zhao, writing in the National Association of Home Builders' (NAHB's) Eye on Housing blog says data from the 2016 American Community Survey (ACS) puts the median age of owner-occupied homes at 37 years compared to a median age of 31 years in 2005. The aging trend, as the figure below shows, accelerated during the Great Recession. Na Zhao, while not denying that the increasing age of housing is a problem, points out that, for builders this aging trend could be, as the saying goes, a feature not a bug. It means a growing market for remodeling. Old structures need new amenities; aging systems and components need repair and replacement; rising home prices encourage home owners to spend more on home improvement. Moreover, Na Zhao says, the number of owner households has been rising since the third quarter of 2016 indicating a strong demand for new construction over the long run to meet and growing population while replacing those homes that disappear from the housing stock. 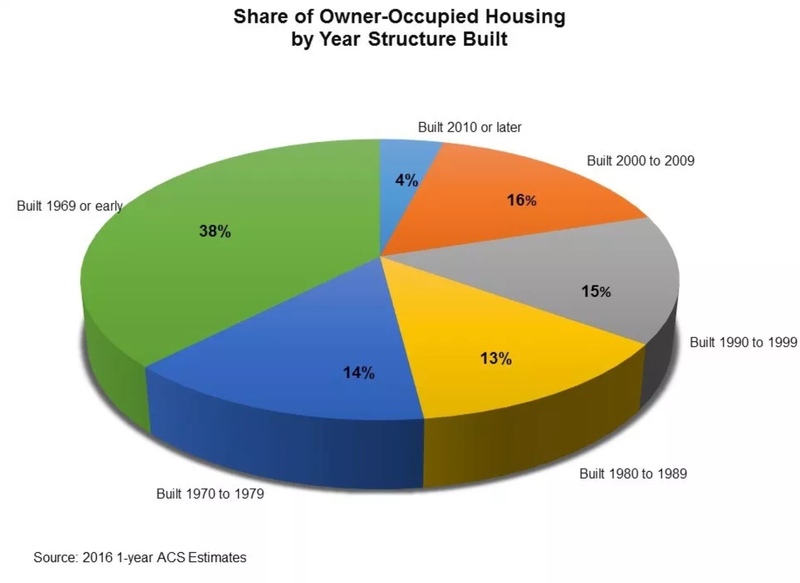 The ACS shows that more than half of today's owner-occupied homes were built before 1980 and 38 percent before 1970. Sixteen percent of the current stock was built between 2000 and 2009 but the 3 million units that came on line between 2010 and 2016 added only 4 percent to the owner-occupied stock. Due to modest gains of housing construction, the share of construction that was six or fewer years old declined greatly since the 2006 ACS when it was 11 percent to only 4 percent in 2016. 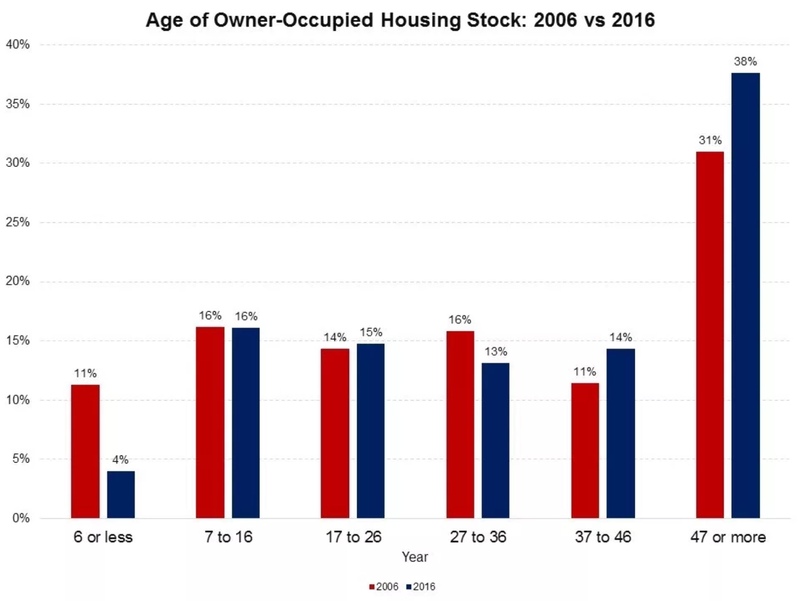 Meanwhile, the share of housing stock built 46 years old or older increased significantly from 31 percent in 2006 to 38 percent in 2016. 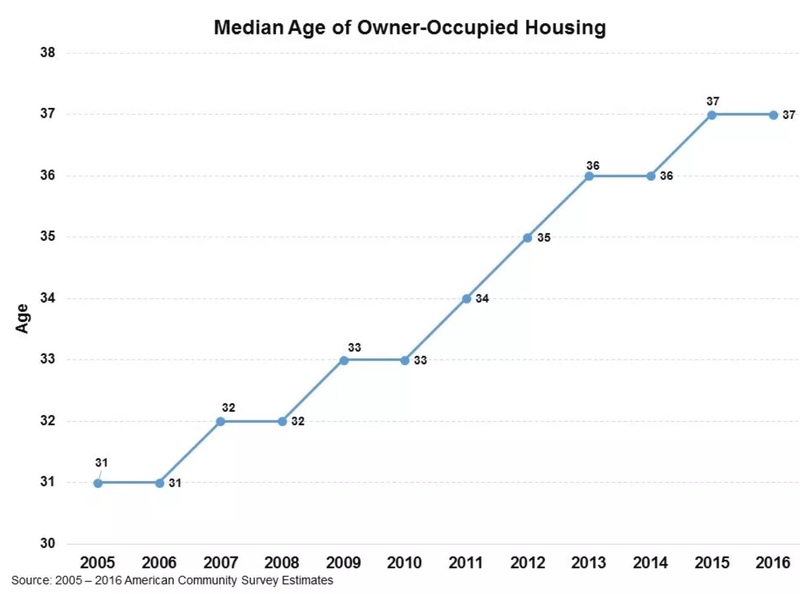 As housing ages, it makes sense that the owners' age increases as well. Twenty-five percent of homes built after 2010 are owned by Millennials and 26 percent by those aged 35 to 44. Only 14 percent are owned by those over 65. The latter age group however own the largest share of all homes built prior to 1989 and 56 percent of those built before 1969. This also implies a growing market for renovations to help older homeowners to age in place.